Health 12 SYMPTOMS TELL YOU THAT YOU'VE A DAMAGED LIVER! 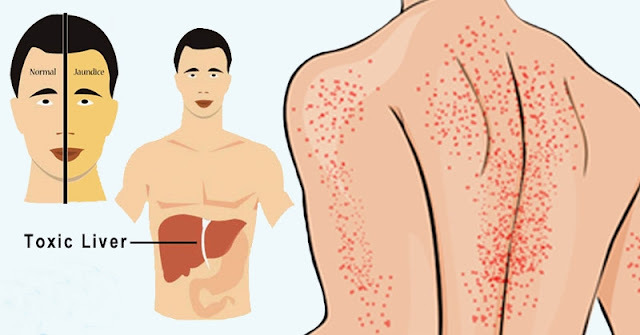 12 SYMPTOMS TELL YOU THAT YOU'VE A DAMAGED LIVER! The liver, which is located in the right upper quadrant of the abdomen and partially protected by the ribs, is the largest solid organ in the human body. The liver is critical for a number of bodily functions. Ergo, it is important to know the signs of liver damage and to take care of the liver. There are over 100 different types of liver disease and each has different manifestations. Some of these disease are hepatitis, alcoholic liver disease, and cirrhosis of the liver and fatty liver disease. People usually mistake these symptoms for something else since they are not specific. Here is a list of the most common early signs. Vomiting and nausea are common symptoms, but they can mimic other diseases like food poisoning, migraines, motion sickness, vertigo, vomiting, depression and early pregnancy. Moreover, they can mimic kidney issues as well. People who have liver damage are likely to suffer from persistent nausea, since the liver’s ability to eliminate toxins had reduced. The nausea can also be due to the constant changes in digestion and metabolism. In case you have these symptoms, consult a doctor. Feeling weak and tired is one of the obvious and early signs of damaged liver. If the liver is damaged, out body works harder, so it needs more rest. This happens because of the toxins in the blood that cannot be eliminated by the liver. In case the symptoms linger, visit your doctor immediately. Loss of appetite happens as a result of not enough bile, which aids with the fat digestion. If the food is not properly digested, it lead to loss of appetite and serious loss of weight. The liver is vital for this process since it produces bile. If the liver is damaged, there can be an increase in diarrhea and indigestion. Moreover, if there is lack of bile, a person may also experience fatty food intolerance, irritable bowel syndrome, gallstones, alcohol intolerance, constipation and abdominal bloating. Changes in the color of the urine might indicate damaged liver. The increased levels of bilirubin in the blood cause the urine to look orange, amber or brown. The levels of bilirubin are increased since the liver is unable to eliminate it, and it is eliminated through the kidneys. Due to lack of bile, the color of the stool can change. Instead of its normal brown color, it can be clay colored, pale yellow, or gray. If this is not persistent, it is not dangerous. However, if it happens constantly, seeking medical attention is necessary. Jaundice is a condition in which the color of the eyes, fingertips, tongue and skin becomes yellow. It is formed when the levels of bilirubin in the bloodstream increase. Jaundice can also be an indication of issues with the gallbladder or pancreas, so consulting a doctor is highly recommended. Cramping or pain in the lower part of your abdomen, or feeling particularly bloated can be an indication of damaged liver. One of the early symptoms of liver damage is ascites, which is fluid accumulation in the abdominal cavity. Fluid retention is one of the early warning signs, particularly in the feet and ankles. Fluid retention can be caused by lymphatic disease, heart failure, hormonal imbalance, and kidney problems as well. In case of liver deficiency, the skin is more sensitive than usual and often flakes and itches, and it is also hypersensitive to touch. There could also be more bruises and increased veins visibility. Keeping the skin moist is helpful, but the problem will not go away till the liver issue is solved. This pain is normal for damaged liver. The liver is responsible for making clotting factors and sans them, there is bleeding of the intestines related with constipation and diarrhea. This is not the full list of early signs of damaged liver. For instance, damaged liver can also lead to hormonal imbalance in men and as a consequence they develop breasts and may suffer from a loss of libido. Nevertheless, consult with your doctor of any changes you are experiencing.